Unique moments photography loves to travel and photograph weddings. Its a chance for us to incorporate a little business into a lot of pleasure. We love to visit new places. We titled the image " Kiri kissing Her Superman". Kiri and greg were married in St Cloud Minnesota. After the ceremony is over, usually on the way to the reception, is a great time to get the bridal party and do some fun shots. Typically there is usually 2 hours of time before the grand march for the reception. If we block off 4o minutes we can stop at a local park or outdoor location and let the bridal party relax and have some fun. All the guys were wearing super hero shirts under their suits. 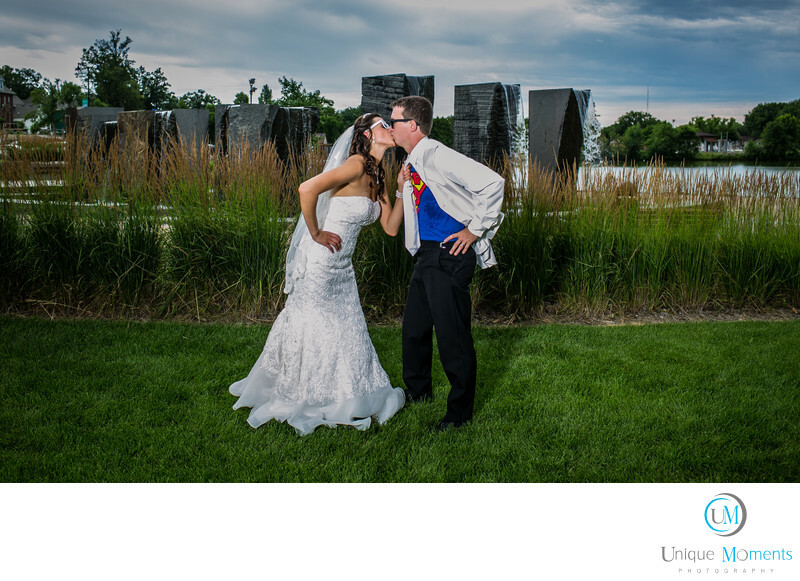 The groom was superman. This was supposed to be a fun cool guy pose. The bride had a different plan, grabbed him by his Tie and kissed him into submission. Load of fun and always a fun time with the bridal party before the reception starts. Location: 1101 Seventh St. S. St. Cloud, MN 56301.